The High Violets - "To Where You Are"
The High Violets are back with a new set of their deep space dream-pop songs. Clint Sargent (guitars/bass/keyboards) and Kaitlyn ni Donovan (vocals/guitar/keyboards) still constitute the core of the Portland, Oregon based band's sound, with bassist Aaron Overstreet and drummer Ben Nugent being relative newcomers, having not appeared on the last album, 44 Down (see AI #22). 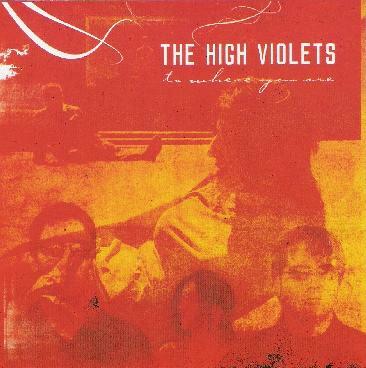 The magic of The High Violet's sound is to be found in the combination of Clint Sargent's melodic yet oh so cosmic guitar and Donovan's indie pop vocals, which have a dreamy quality that both contrasts and compliments Sargent's space rock leanings. Most of the songs barely hit the 4 minute mark, yet Sargent skillfully injects enough instrumental coloring and pulsating reverb into the songs to produce a style that draws on the psychedelia of old, while remaining firmly in contemporary indie-pop territory. Case in point is one of my favorite tracks, "Want You", which in the span of a mere 3:40 manages to launch into instrumental space, without abandoning the controlled structure of the song. Fans of bands like Spiritualized and Floorian will dig this for sure, as will space rockers with an appreciation for adventurous pop music. Hear songs sample at the band's Myspace web site: http://www.myspace.com/thehighviolets.